Two teams of researchers have used data from Chandra and other telescopes to map dark matter in 3-D in a galaxy cluster. The galaxy cluster is known as Abell 383 and it is found about 2.3 billion light years from Earth. Both teams found the dark matter to be distributed in the shape of an American football, with the point close to the line of sight. Dark matter is invisible material that does not emit or absorb any type of light, but is detectable through its gravitational effects. Two teams of astronomers have used data from NASA's Chandra X-ray Observatory and other telescopes to map the distribution of dark matter in a galaxy cluster known as Abell 383, which is located about 2.3 billion light years from Earth. Not only were the researchers able to find where the dark matter lies in the two dimensions across the sky, they were also able to determine how the dark matter is distributed along the line of sight. Dark matter is invisible material that does not emit or absorb any type of light, but is detectable through its gravitational effects. Several lines of evidence indicate that there is about six times as much dark matter as "normal", or baryonic, matter in the Universe. Understanding the nature of this mysterious matter is one of the outstanding problems in astrophysics. Galaxy clusters are the largest gravitationally-bound structures in the universe, and play an important role in research on dark matter and cosmology, the study of the structure and evolution of the universe. The use of clusters as dark matter and cosmological probes hinges on scientists' ability to use objects such as Abell 383 to accurately determine the three-dimensional structures and masses of clusters. The recent work on Abell 383 provides one of the most detailed 3-D pictures yet taken of dark matter in a galaxy cluster. Both teams have found that the dark matter is stretched out like a gigantic American football, rather than being spherical like a basketball, and that the point of the football is aligned close to the line of sight. 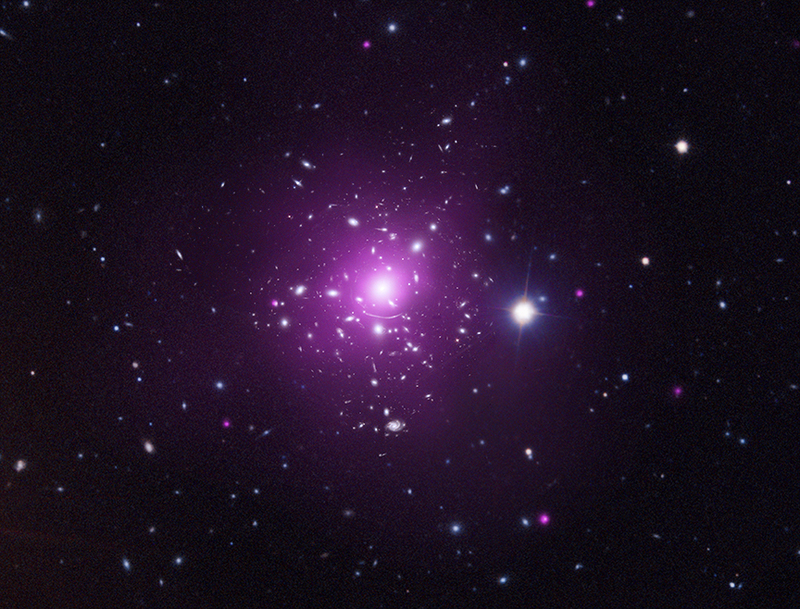 The X-ray data (purple) from Chandra in the composite image show the hot gas, which is by far the dominant type of normal matter in the cluster. Galaxies are shown with the optical data from the Hubble Space Telescope (HST), the Very Large Telescope, and the Sloan Digital Sky Survey, colored in blue and white. Both teams combined the X-ray observations of the "normal matter" in the cluster with gravitational lensing information determined from optical data. Gravitational lensing - an effect predicted by Albert Einstein - causes the material in the galaxy cluster, both normal and dark matter, to bend and distort the optical light from background galaxies. The distortion is severe in some parts of the image, producing an arc-like appearance for some of the galaxies. In other parts of the image the distortion is subtle and statistical analysis is used to study the distortion effects and probe the dark matter. A considerable amount of effort has gone into studying the center of galaxy clusters, where the dark matter has the highest concentration and important clues about its behavior might be revealed. Both of the Abell 383 studies reported here continue that effort. The team of Andrea Morandi from Tel Aviv University in Israel and Marceau Limousin from Université de Provence in France and University of Copenhagen in Denmark concluded that the increased concentration of the dark matter toward the center of the cluster is in agreement with most theoretical simulations. Their lensing data came from HST images. The team led by Andrew Newman of the California Institute of Technology and Tommaso Treu of University of California, Santa Barbara (UCSB) used lensing data from HST and the Japanese telescope Subaru, but added Keck observations to measure the velocities of stars in the galaxy in the center of the cluster, allowing for a direct estimate of the amount of matter there. They found evidence that the amount of dark matter is not peaked as dramatically toward the center as the standard cold dark matter model predicts. Their paper describes this as being the "most robust case yet" made for such a discrepancy with the theory. The contrasting conclusions reached by the two teams most likely stem from differences in the data sets and the detailed mathematical modeling used. One important difference is that because the Newman et al. team used velocity information in the central galaxy, they were able to estimate the density of dark matter at distances that approached as close as only 6,500 light years from the center of the cluster. Morandi and Limousin did not use velocity data and their density estimates were unable to approach as close to the cluster's center, reaching to within 80,000 light years. Another important difference is that Morandi and Limousin used a more detailed model for the 3-D map of dark matter in the cluster. For example, they were able to estimate the orientation of the dark matter "football" in space and show that it is mostly edge-on, although slightly tilted with respect to the line of sight. As is often the case with cutting-edge and complex results, further work will be needed to resolve the discrepancy between the two teams. In view of the importance of resolving the dark matter mystery, there will undoubtedly be much more research into Abell 383 and other objects like it in the months and years to come. If the relative lack of dark matter in the center of Abell 383 is confirmed, it may show that improvements need to be made in our understanding of how normal matter behaves in the center of galaxy clusters, or it may show that dark matter particles can interact with each other, contrary to the prevailing model. The Newman et al. paper was published in the February 20, 2011 issue of the Astrophysical Journal Letter and the Morandi and Limousin paper has been accepted for publication in the Monthly Notices of the Royal Astronomical Society. Other members of the Newman et al. team were Richard Ellis from Caltech, and David Sand from Las Cumbres Global Telescope Network and UCSB. Coordinates (J2000) RA 02h 48m 06.96s | Dec -03° 29´ 31.81"
This is really interesting. Thanks a lot. Much work has and will be completed in this compelling subject. I wonder if maybe dark matter is simply matter that exists beyond the absolute zero mark that defines the slowest speed of regular matter. I want to see these things my self. Wow, I wish I could see that for my self. it would be very fascinating. I give the research team a big thumbs up. My question is in reference to gravitational lensing. Does gravitational lensing actually distort or bend the light from the stars, or is it caused by gravitational forces where the stars are caught in the tidal pull towards a black hole? Is the ark that is located at the bottom of the center of Abell 383 a true ark, or is it because of the gravitational lensing? It is really fascinating. I like it. You are excellent, really great, We are proud of you. That is a fascinating picture and research around dark matter. Kudos to the research team! A cluster of galaxies located about 2.3 billion light years from Earth. 2.3 billion light years from Earth. 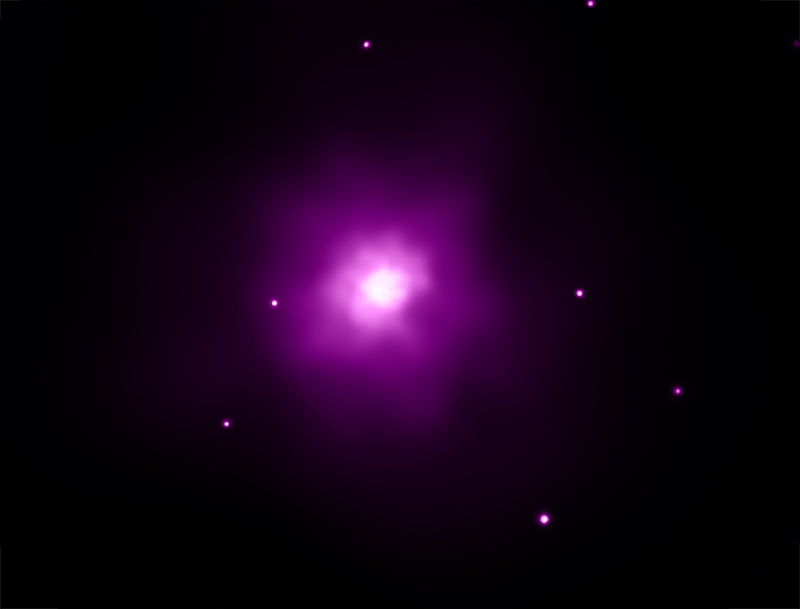 X-rays from Chandra X-ray Observatory with Optical data from Hubble Space Telescope, the Very Large Telescope, and the Sloan Digital Sky Survey. 4.84 million light years across. X-rays are purple, Optical in white and blue. In the constellation Eridanus, seen in the Northern and Southern Hemispheres.